The following research offers valuable insights on the latest trends in collective redress litigation and the tactics and strategies litigation funders and entrepreneurial plaintiffs' firms are using to expand their business models and bring more lawsuits in European courts. The research also offers recommendations for reforms to stop the spread of U.S.-style class actions abroad. Below is also a public opinion poll of over 5,000 European consumers. 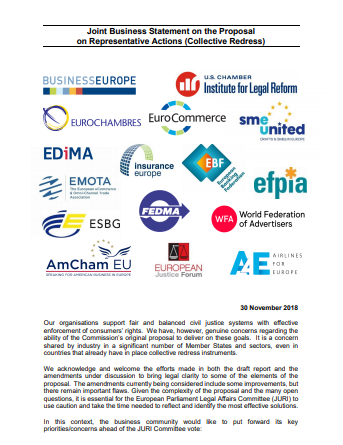 The data shows that consumers do not want the European Commission to introduce a collective redress system without safeguards in place. The cost of the U.S. tort system, and how similar policies ca increase the EU’s legal system cost. A statement from the business community on the collective redress proposal. A walk-through on collective redress, how it works, what it might cost, and how to improve the European Commission’s proposal. 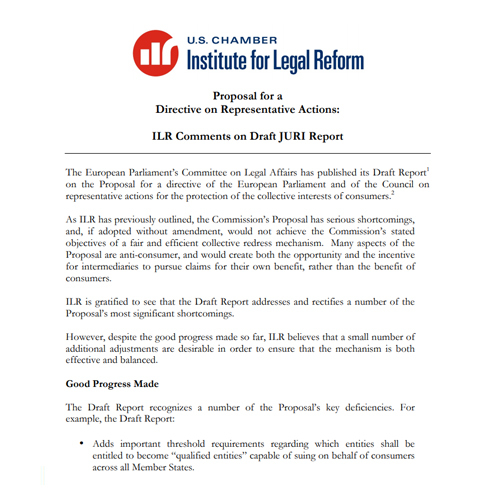 Comments released by the U.S. Chamber Institute for Legal Reform regarding the European Parliament’s Committee on Legal Affairs’ Draft Report on the representative action directive.